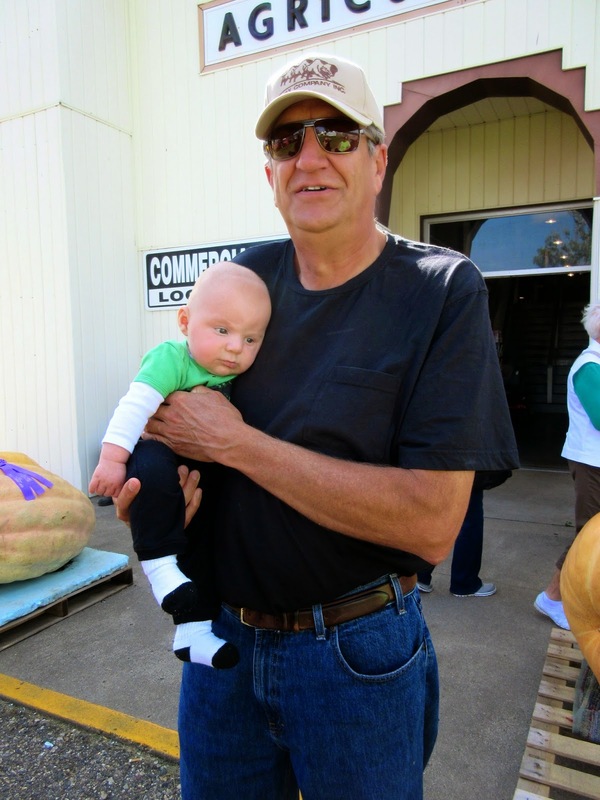 As summer draws to a close, it brings with it not only cooler weather, but the end of fair season in the Midwest. 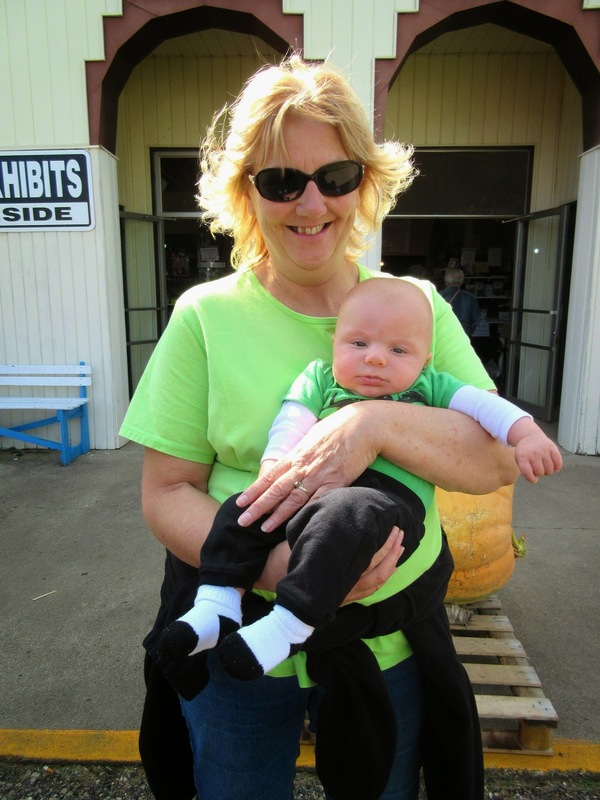 If you can remember, we ventured out to the fair earlier this summer while on a trip back to my hometown. 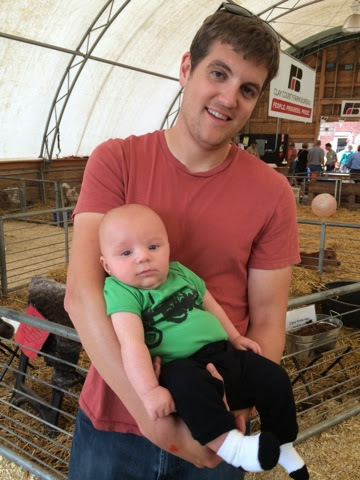 C wasn't too impressed with his first fair experience beyond the cattle barn, but now almost two months later, we figured we'd give it another go. 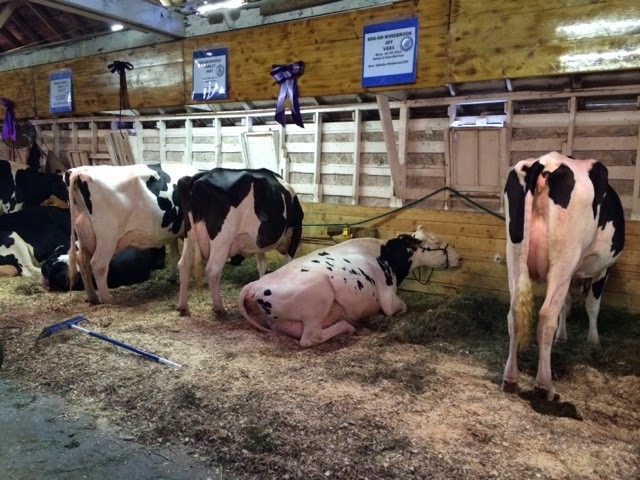 This week is the Clay County Fair, one of the biggest county fairs in the nation. Seriously. There are people that pass through the area from not just Iowa, but states and countries near and far. I would venture to say that it is what T's hometown is known for, and is a definite highlight of the year in our rural Midwest neck of the woods. 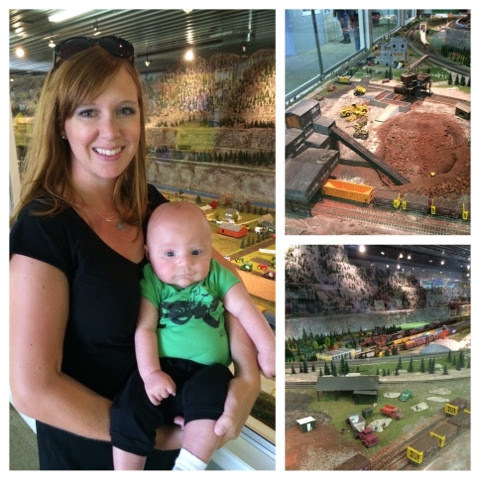 The weather was perfect, and since we went during the week instead of opening weekend, the crowds weren't too bad. 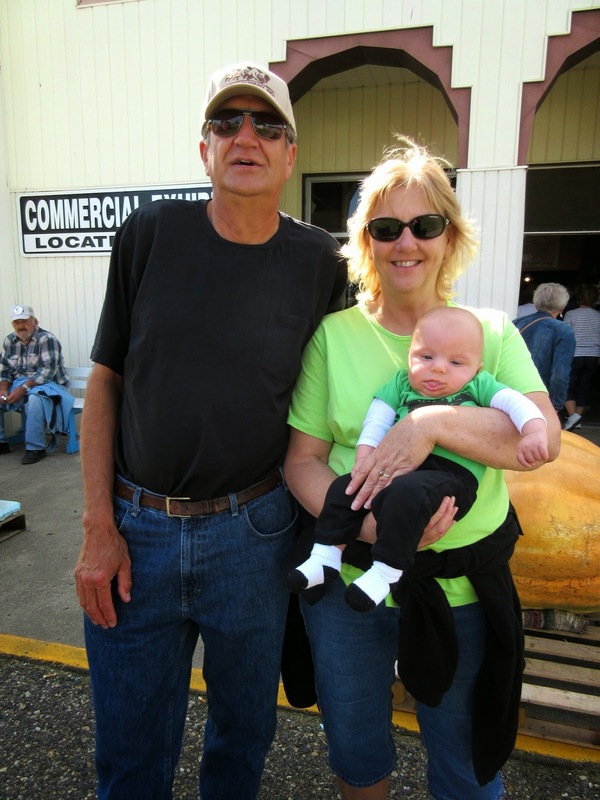 Here we are standing next to the best pumpkin at the fair this year. I think it weighed about 475 lbs. Crazy! You'd need a forklift just to get it out of the field. I'd like to know what the lucky winner was feeding it to get it to grow so big! 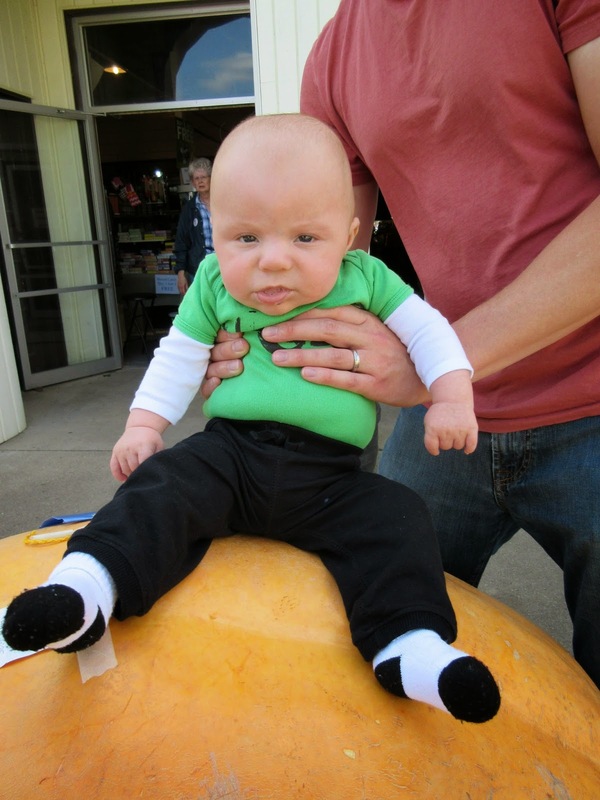 As you can tell, C was pretty impressed with the giant pumpkin. 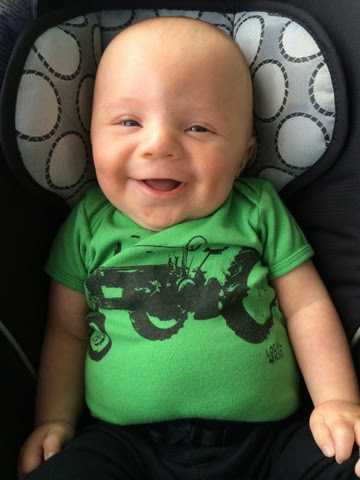 C was feeling festive, and had a special outfit with a tractor all ready to go for his trip to the fair. We met up with T'a parents for lunch after he snuck in an appetizer of cheese curds. He really wanted the mini-donuts, but I nixed them until dessert. Ahhh fair food...fried, greasy, and delicious. An indulgence for sure, but a must while exploring at the fair. If you get a chance to go, I would highly recommend grabbing a southwest tenderloin sandwich from the food stand at the northeast corner of the pig and sheep barn (sorry I don't remember the exact name...maybe Town House Tenderloins?? It stands by itself, so it's hard to miss). Hands down the best tenderloin T & I have ever had. Ever. Of course with all the eating going on, C had to eat too, and I was pleasantly surprised to find there are three designated areas, staffed by the hospital, for nursing mothers. We ended up in one of the towers by the east entrance that is also a first aide station (the other two spots are in the 4-H building, and the Events Center, although I never did see either of them). I'm guessing not many people ever have a chance to go in the tower, so it was fun to see what it was all about. They also had it stocked with an awesome book, The American Academy of Pediatrics New Mother's Guide to Breastfeeding, that has loads of invaluable information that I would highly recommend to any new mamas out there. 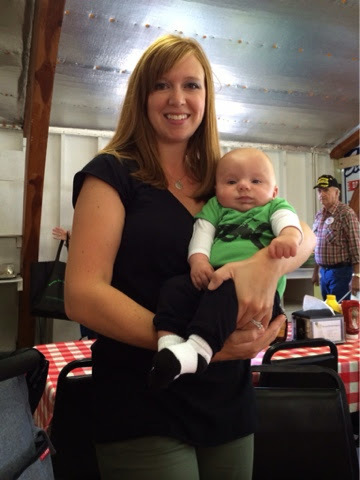 Topics were incredibly useful covering everything from nutrition tips, to how to know if your baby is getting enough, to breastfeeding a teething infant. 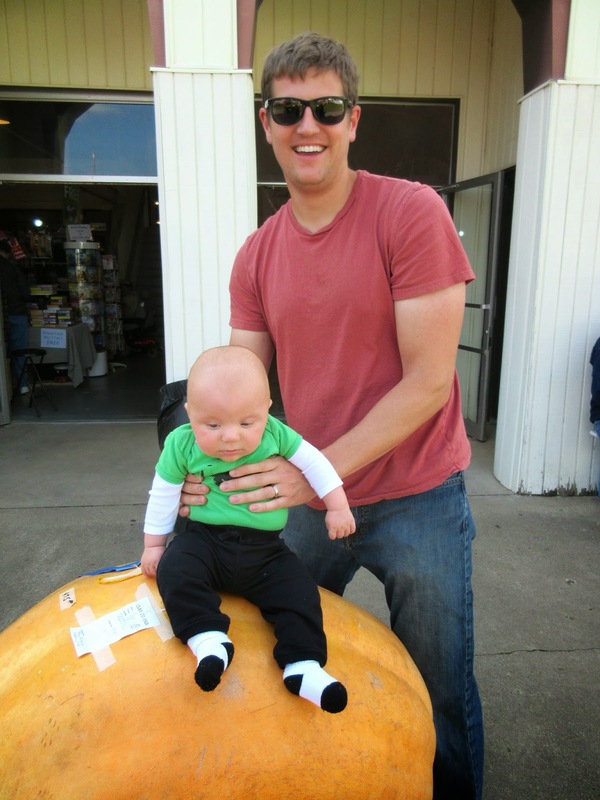 A couple sections I found of particular interest: On including your significant other: 'There are many ways to be a parent besides feeding the baby. Your partner can provide you with nutritious meals so you can better feed your infant, help with household chores so you can rest, play with the baby during awake time, and rock him to sleep by holding him against his chest and singing in a low, rumbling voice', (ahem T...are you listening??). On nutrition: 'A glass of wine or a cup of coffee is fine while nursing. In general, moderation is the key.' Considering this is coming straight from the American Academy of Pediatrics, I'll drink to that! We enjoyed showing C all of the animals and tractors that we have been reading about in a couple of our favorite farm books My Farm Friends by Wendell Minor, and Johnny Tractor and His Pals. These little critters were all in 'Grandpa's Barn', a kid-themed animal barn filled with baby animals. 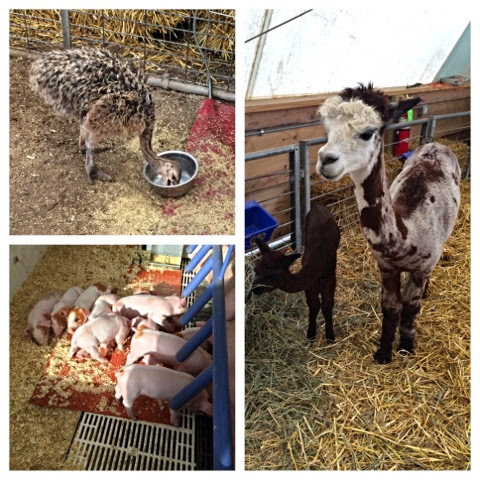 We saw baby ostriches, a baby alpaca, and baby pigs among others. So much fun! 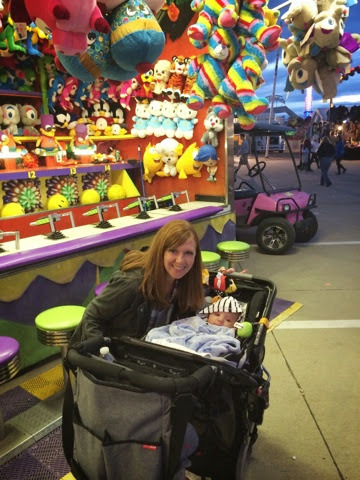 C had so much fun on his trip to the fair that we decided to head back last evening just to make sure we didn't miss anything. 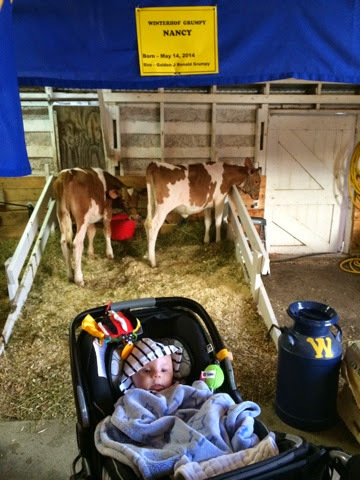 It was much colder with temps hovering at the 50 degree mark, but we bundled up and got to see dairy cows, sheep, pigs, antique cars & tractors, 4-H exhibits, and check out the Midway all before calling it a night. 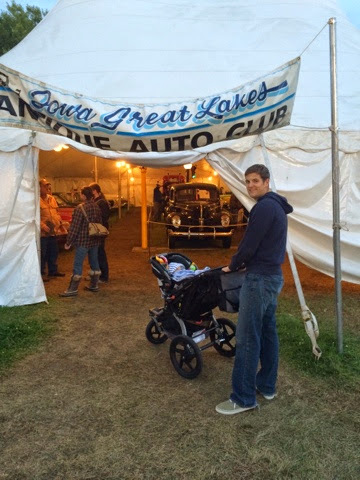 T couldn't wait to get to the auto tent to look at the antique cars. 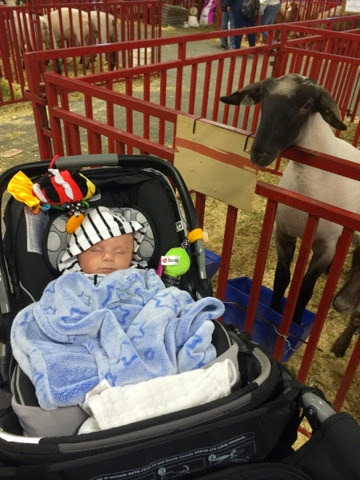 This friendly sheep was very excited to meet C, notice how it is trying to crawl out of it's pen, but C wasn't too interested, and thought it was the perfect time for a little snooze. 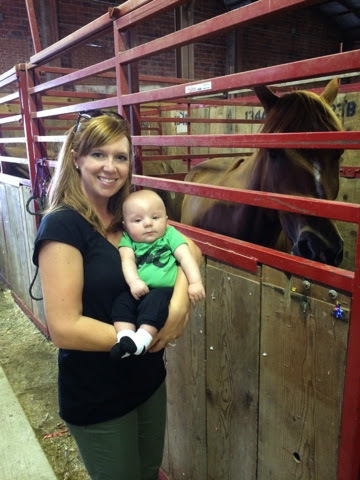 C enjoyed the cattle barn again, keeping his eyes open the whole time and listening to the moo-moo cows. We were excited to see this baby calf (on right) that was born just 2 days before C! 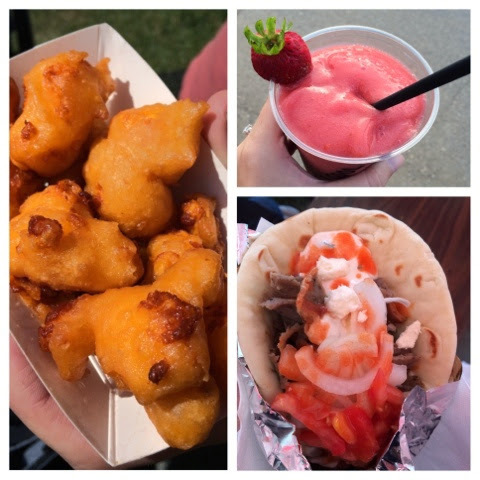 What is your favorite thing to see, do, or eat at the fair?